This was a new partnership between PAMIS and RNIB. The club ran once a month on a Saturday 10:30am to 3:30pm with lunch, in RNIB Springfield Centre, a safe purpose-built building for people with complex learning disabilities. Facilities include a sensory room, sensory garden, music room and trampoline. The club was separated into 2 identical sessions (AM/PM), starting with a welcome refreshment enabling all to settle and meet other families and volunteers. A different theme was selected each month and all activities were designed around this. These included parachute games, Ceilidh, multi-sensory storytelling, baking, music, rebound therapy, art and crafts. Children with Profound Multiple Learning Disabilities aged 8-19 years and their families attended. The club was widely promoted via emails to families on the PAMIS and RNIB mailing list and through social media. Family carers were able to participate in the activities but were also able to enjoy their own time, socialising with other families, volunteers and staff (the club did not provide personal care so the carer was required to stay). Success was dependent on the volunteer workforce. This has been challenging not least in getting enough volunteers to give up a regular Saturday. Splitting the day, allocating tasks and providing training and development has assisted. 6 regular families came from areas most affected by poverty and inequality across Scotland based on SIMD 15% Index. My Time grew from only few participants to at least 20 each day, and continues to increase. We planned to have 18 families for each session, however, we realised that 10 families for each session is the maximum given the building restriction and the effect of a busy environment on the sensory processing issues of the young people with Profound Multiple Learning Disabilities. We had planned to run the club twice a month but struggled with human resources required for this. Volunteer’s recruitment and management has been one of the biggest challenges of delivering this project. To run the club for people with Profound Multiple Learning Disabilities we required many volunteers or staff, since most of the people required 1:1 support to engage in activities. We also needed to provide a diversity of activities which required more volunteers or staff. There were only two funded workers in this project, which made the importance of building a sustainable and sizeable volunteer workforce more paramount. Many volunteers were students on placement with our organisation, and their friends. A number of them disappeared after the end of placement due to new placement and work demands and only intermittently returned or didn’t come back at all. The most helpful and sustainable volunteers were those who lived locally and were not recruited from placement. We realised that the sense of satisfaction they got from supporting people with Profound Multiple Learning Disabilities and their families was not always enough to keep them. PAMIS are committed to developing the volunteer workforce and also realise that working with people with Profound Multiple Learning Disabilities can be challenging. We ran free professional training for them which they highly valued and were eager to apply their new skills in the club. This increased their commitment to the club. We also presented them with certificates as recognition of their valuable contribution and this also appears to have enhanced their engagement. We had also considered arranging social events but this did not materialise. Many volunteers enjoyed the social aspects of volunteering at My Time and creating new friendships with other volunteers and staff etc. In the future, organising informal social gatherings might further support the commitment of the volunteer workforce. Volunteering at this level within PAMIS was new to us and we have benefited from learning from what works and what doesn’t. It also enabled us to fine tune all our volunteer forms and policies. This project was specifically aimed at children and young people and was new ground for both organisations as there are no weekend clubs for this group of complex children. Although both organisations have experience in working with this group running a club for the whole family was a new venture. The development of the programme was organic and people with Profound Multiple Learning Disabilities and their families were instrumental in shaping the activities. We learnt how to interpret the young people and their likes and dislikes. We learnt from the first session what was likely to work and what was not. We planned, studied, did and acted (PDSA) after each session and the debrief was important in order to adapt for the next session. This experience has not only increased the confidence and skills of the staff but of the volunteer workforce. It has also enhanced team working and we have discovered new talents within the team that we were not aware of! At the end stage of the funding period, we found that there was still some budget available. The surplus within the budget was in part due to generosity of volunteers, staff and the excellent resources at RNIB. We were keen to make the most of this opportunity to spend the surplus to enhance the lives of the group we support. The families at the club had indicated an interest in going to a safari park which has accessible facilities. Many families highlighted that they had not previously had the time or the money to do this as a family. Also many families do not have access to a car, therefore going to safari park was virtually impossible for them. We were able to organise this at short notice, completing the budgeting, organising an accessible coach, promoting it to the families, purchasing tickets, conducting risk assessment, human resources management etc. As a result we successfully held the first day trip we’ve ever organised in this area and positive feedback from families was overwhelming. This was a development opportunity for the project worker and one in which he excelled. The project was run in partnership with RNIB, therefore there were many aspects of running this project that needed to involve both organisation. Inter-agency working can be challenging due to the different style of communication and working culture but we have worked through our differences and reached mutual understandings. We continue to have meetings regularly to discuss all aspects of the club including planning activities and staffing of the club. The RNIB building is ideal for My Time and offers many opportunities for varied adapted, fun activities. This relationship will continue and we are also exploring the model in other areas with RNIB but also other partners. The child or young person with profound and multiple learning disabilities (PMLD) will respond to the repetitive nature of the activity and over a longer period will show positive signs of understanding and enjoyment and hopefully this will spill over into their home life. All children and young people with Profound Multiple Learning Disabilities showed positive signs of understanding and enjoyment in the adapted activities we planned because we know that each person with Profound Multiple Learning Disabilities is unique and might enjoy different aspects of activities. Each time we offered at least 4 different adapted activities to cater to everyone, including their siblings. An example is in musical activities, we heard young people with Profound Multiple Learning Disabilities trying to sing along or vocalise, and play different instruments with focus and smile on their face in group parachute games, we heard so much laughter and giggles from young people with Profound Multiple Learning Disabilities, as well as from their siblings, on the trampoline, we saw young people with Profound Multiple Learning Disabilities showing signs of satisfaction, enjoyment, smiles etc; with the rebound therapist ensuring a safe and functional environment. The first My Time session girl B attended, she wasn’t enjoying it at all, she was crying, screaming, lying on the floor and biting herself. Her parents had to leave early. The second time they came, staff and volunteers already gathered a bit of information about her likes and interests and carefully introduced her to various sensory activities. This time she seemed more settled. As time went on, staff and volunteers started to introduce her to some music activities as well. At first, girl B would sit down and listen to the music without doing much, then one day she decided to play with the musical instruments and showed intense focus that we hadn’t seen before. Although girl B had become more settled she still wasn’t quite into group activities. Staff and volunteers identified that and introduced her to group activities by cleverly utilising her interest in music; adding many musical elements into various group activities. Girl B now felt more comfortable being with other people. Now, every time she comes into the club, she will have a smile on her face and walk into her favourite sensory room by herself. 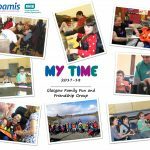 Good communication between families and PAMIS/RNIB and new friendships with other families providing much needed emotional support. Families have reduced stress and can enjoy valuable time to relax knowing their child is in a safe, happy environment, with regular attendance of the whole family. According to the written evaluation forms we collected at the first club and the last club (2017-18), parents agreed that the club helps them to feel better supported (1st club: 77%, Last club: 100%); and improved morale as a carer (77%, 100%); Reduce social isolation and loneliness (88%, 100%) and increased social circle and connections (77%, 100%). It also shows the improvement of the club, rising from overall 79.75% to 100% agreement. We have 10 regular families, attendance more than 70%), out of 20 families registered with the club. Family A has 100% attendance from the first club to current date. At first it was only the mum and daughter with Profound Multiple Learning Disabilities but then as time went on, the whole family, including father and young brother and they enjoyed every single bit of it. They would sometimes enjoy the activities together, sometimes they would all go into different rooms and enjoy various activities we organised. Other times the parents would be sitting in the dining room chatting with other parents knowing that their children are having fun and enjoying the activities in a safe and happy environment with our staff and volunteers. This demonstrated a huge degree of trust by the family towards the staff and volunteers involved. Carers will tell us they have the confidence to take time away from their intensive care roles and have built up trust and confidence with volunteers. Family carers look forward to coming to the club where they state they have had the opportunity to have quality time as a family. According to the written evaluation forms we have collected at the first club and the last club we run in 2017-18, parents agreed that the club helps them to “live a life outside of caring” (1st club: 66%, Last club: 100%) It also shows the improvement of the club in achieving outcomes. Mum B always comes to the club with her son with Profound Multiple Learning Disabilities. At first the son would only sit next to his mum and not engage with other activities. As time went on, staff and volunteers have built up trust and rapport with the son so that they can support him to engage in activities without his mum being present. Mum B would always relax in the dining room, either chatting with other parents or playing games on her mobile phone. Once she commented to the staff that they really love coming to the club as both herself and her son could get some “my time” at the club to do her own things independent of each other. Carers will regularly attend the club and link with other families and organisations. Observe happier and more relaxed families who are more engaged with each other. Family carers will take up the opportunity to participate in a therapeutic session. According to the written evaluation forms we have collected at the first club and the last club we run in 2017-18, parents agreed that the club helps them to “Be more able to sustain their caring role” (1st club: 66%, Last club: 100%) It also shows the improvement of the club in achieving outcomes. At the club we regularly provide Rebound Therapy and Massage Therapy. They are always very popular as parents claimed that the behaviour and personal care eg. Suction, of their children with Profound Multiple Learning Disabilities would improve after Rebound Therapy, which would make the caring role easier. Also parents loved the 1:1 Massage Therapy we provided. They all reported to have reduced stress and feel more relaxed afterwards. It in turn helps them to sustain their caring role. Family carers will access a wider range of fun activities within their own communities and community setting such as leisure centres will feel more confident to offer activities to people with Profound Multiple Learning Disabilities and their families. 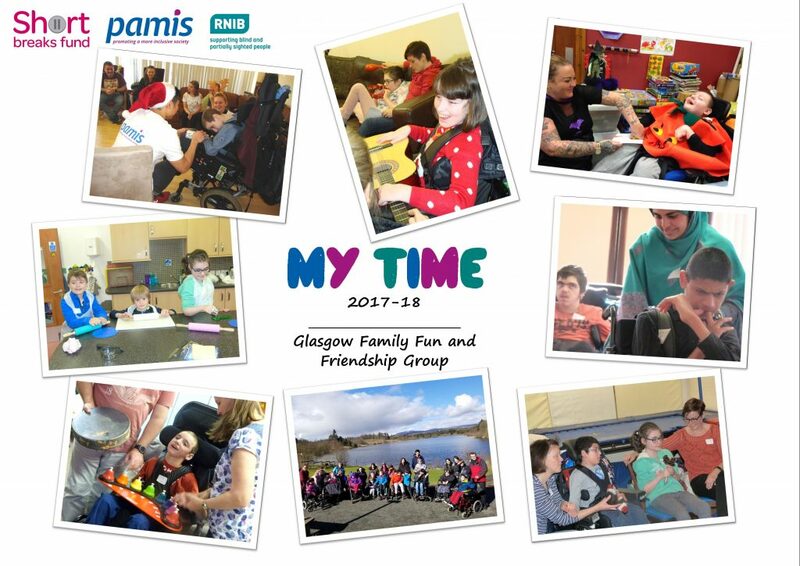 The My Time Family Fun and Friendship Club is run in partnership with RNIB, at their RNIB Springfield Day centre for Adults with disabilities. One of the major outcomes they would like to achieve is to let more young people with disabilities and their families know about their adult service and thus when they leave school they would choose RNIB as their service provider. Many of the families who attended the club did not know anything about RNIB and how fantastic their facilities are. As a result, some families going through transition have selected RNIB as their adult service provider. Family V first heard about the club from a flyer we sent out the school. They did not know about PAMIS nor RNIB Springfield, let alone any weekend activities for their son with Profound Multiple Learning Disabilities. They decided to come to our club and see if it was suitable for them. They came and found that this is exactly what they need. They then registered with PAMIS, which allowed them to participate in adapted leisure activities, workshops, training etc. It also allowed them to be part of this network/community, receiving the latest and most relevant information, as well as being supported or supporting others when needed. They have become regular members of My Time and are also referred to both PAMIS’s Family Support Service and Transition Service. Communities and other agencies will engage in more inclusive family fun activities for this group of marginalised people. Families will feel more confident that their needs will be met within their local communities. The club involved two organisations PAMIS and RNIB. Most of the activities are led and organised by PAMIS or RNIB at the RNIB Springfield Centre, therefore there has been a limited involvement with the communities and other agencies. However, to meet this outcome we recruited and used many of students in Health & Social Care, and as a result of the students being involved in the club, there are a better understanding of the role of short breaks in supporting caring relationships, and a better understanding of the short break needs of disabled children and young people, and their carers. Families identified that there is not a lot on offer at weekends. A new volunteer was recruited from a University in Glasgow. Although she is an Occupational Therapy student, she had not worked with people with Profound Multiple Learning Disabilities before and said she didn’t feel confident working with children with Profound Multiple Learning Disabilities. However, after induction and helping the student to build relationship with the families, she worked so well with people with Profound Multiple Learning Disabilities and enjoyed it so much. She commented although she learnt about people with Profound Multiple Learning Disabilities from her course that by engaging with the families and hearing about their daily barriers, struggles, difficulties, it really gave her a better understanding of the role of short breaks in supporting caring relationships, and a better understanding of the short break needs of disabled children and young people, and their carers. She was able to share with her peer group and because of that, in the future, there will be more practitioners who have a greater understanding about people with Profound Multiple Learning Disabilities and their families. "What a great weekend, feeling more relaxed and less anxious about the future"